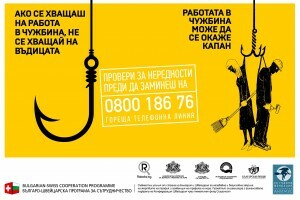 This year together with our partners from New Moment New Ideas, Masters of the Broadcasting and Rabota.bg, we used a more provocative approach to draw the attention of people looking for seasonal or permanent positions abroad to the risks of becoming involved in a trafficking situation for labour exploitation as well as to show them how to spot dangerous and misleading offers. 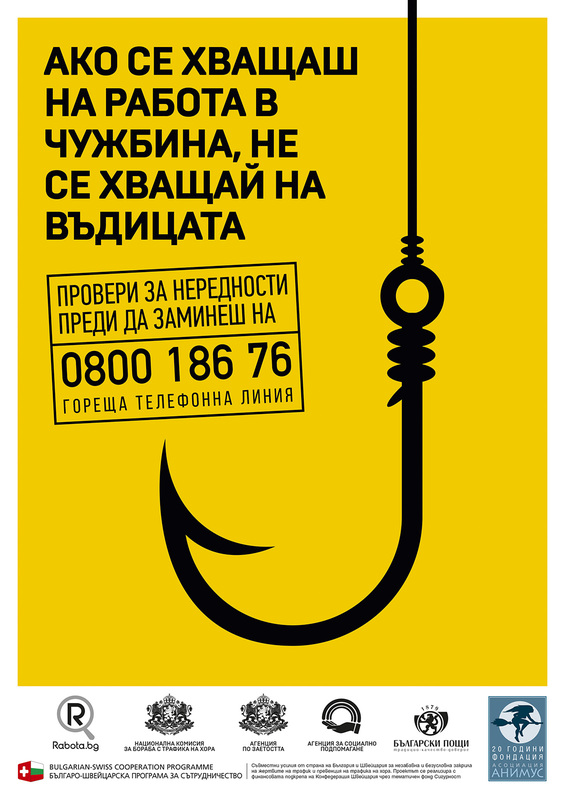 The campaign is implemented with the media support of the „Masters of the Broadcasting” TV show and in official partnership of Rabota.bg, the National Commission for Combating Trafficking in Human Beings, the Employment Agency, the Agency for Social Assistance, Directorate General “Border Police” and Bulgarian Posts Offices. 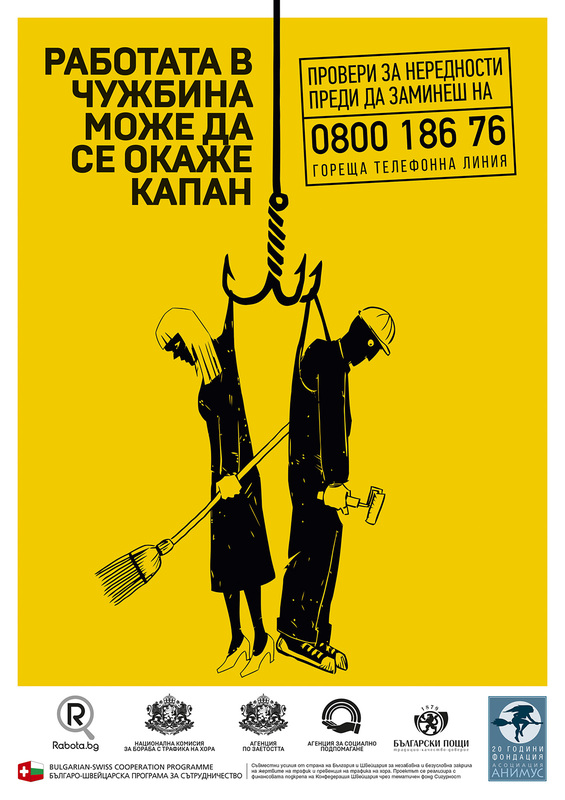 Ac cording to the International Labour Organization a total of 21 million people worldwide are victims of labour exploitation and are trapped in a situation of forced labour after being deceived into it. 18.7 million people (90%) are forced to work in the private sector with 14.2 million (68%) of them are exploited in agriculture, construction, manufacturing and as domestic work. 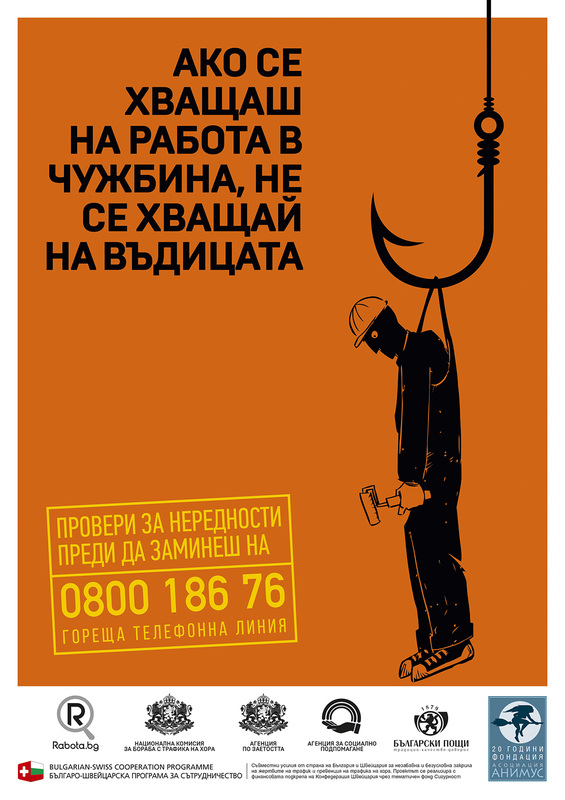 In Southeastern Europe every 4th person (around 1000 people) is a victim of labour exploitation. Trafficking for labour exploitation has the second highest rate of number of victims after sexual exploitation. According to the official data from the National Commission for Combating Trafficking in Human Beings for 2013 the victims are 44, for 2014 – 16, while in 2015 the victims are 22. sually, boys and men are more affected, while cases of women and girls are significantly lower for the same period. 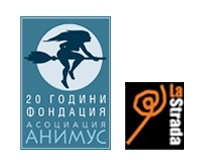 Animus Association Foundation as well as the other non-government organizations working directly with victims of traffic including those identifying them informally, observe a tendency for aligning the number of victims between the two forms of this crime as well as an increase of the cases of human trafficking for labour exploitation within the last two years.